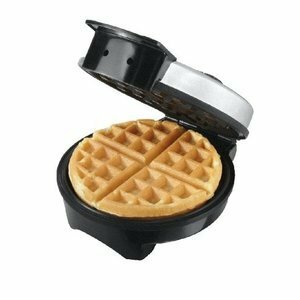 Cooking breakfast has become a pleasurable task with this stainless steel 8-inch waffle maker. Power on and ready lights indicate when to add batter and when they are cooked and ready for serving. An adjustable temperature control for lights and fluffy or crispy waffles cooks perfectly to a preference. The nonstick plates are divided into four quarters for even cooking. Its cool touch handles allows you to open and close the unit with ease.